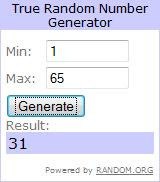 Yay for Tabathia, comment #31, our Candyland Game giveaway winner! She is the final winner in our Family Game Month. I really hope you all enjoyed the giveaways!!! If you know of any specific companies you'd like to see reviewed/given-away here, feel free to email them and let them know you'd like to see them here! Update from Chana: The women from Early Intervention came to see us this morning. They gave us lots of toys to play with and were writing down about how we played with the different toys. They told Mommy and Daddy that I'm a little behind in a few areas, including understanding words. But we aren't worried. They just don't understand the language Dovid and I use to talk to each other. We could care less about English...it's not as much fun as squeaking and screeching. We sure had a lot of fun! Update from Dovid: As my sister told you, we had a nice visit with the Early Intervention women. Boy, did I have fun flirting with them! I played with blocks and ate Cheerios, and they tried to get me to talk. Ha! They just don't understand that "de dah" in different inflections means everything in the English language. I'm also a little bit delayed in my fine motor skills, but Mommy says that we're going to work on everything, and I'll catch up in no time! I'm so glad to see that everything went well with Early Intervention.